New for 2013, show your 3s to 8s how Christmas shines bright and true when you give away the love God gave to you. Even the youngest will find the real meaning of Christmas in this festive VeggieTales extravaganza. Looking to entertain and engage kids this Christmas? Larry The Cucumber is a Christmas elf at the Spring Valley Mall who just wants to spread joy at the holidays. When he meets a little girl with a big heart whose only Christmas wish is to help a friend in need, "Merry Larry" sets off on adventure that will light up the holidays like never before and show the town of Spring Valley what Christmas is all about - "Christmas shines most bright and true when you give the love God gave to you!" Featuring the new Silly Song with Larry: Wrapped Myself Up For Christmas! Running Time: Approx. 47 min. Created for children aged 3-8, youngest children will enjoy the lively music and animations, while older children will engage with the clever and witty songs and verses - a fun way to remember key Bible stories and teachings. 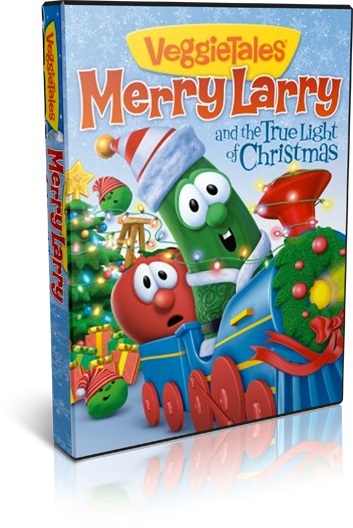 Merry Larry and the True Light of Christmas DVD by Veggietales was published by Authentic in October 2013 and is our 13199th best seller. The ISBN for Merry Larry and the True Light of Christmas DVD is 5060256821090. As good as ever! These VeggieTales get to the heart of Bible stories and the Christian message. This time the Veggie crew show that all the trappings in stores, trying to encourage us to spend more and more, is not what the true message of Christmas is all about. The theme of this story is 'Giving the love God gave to you' and 'Helping the Community all year long'. It takes a little girl to make Merry Larry, the Christmas elf in Spring Valley Mall, realise that there is more to Christmas than buying expensive presents surrounded by pretty lights and glitzy decorations. This little girl is trying to help her elderly neighbour have a new house instead of the tumbledown one she has at the moment. Merry Larry mistakenly believes he has been given permission to strip his uncle's shopping mall of all its Christmas lights and light up the old lady's house to make people notice its dilapidated state. It works a treat and the neighbours rally round to help repair it. Back at the Mall, the Christmas crib is found in the storeroom and returned to pride of place as in former years. With the usual lively animation and jiggy songs, familiar and new, this will entertain and teach little ones as well as older addicts of the series. Complete with the usual bonus features including an extra song, this is delightful and highly recommended. Got a question? No problem! Just click here to ask us about Merry Larry and the True Light of Christmas DVD.